Keywords: Changes in cognition, older adults, dementia, automated assessment. Alzheimer’s disease is the sixth leading cause of death in North America. Statistics show that one in nine Americans, and one in eleven Canadians, aged 65 and older have Alzheimer’s disease. As the “baby boomer” generation ages, both the proportion and number of older adults with dementia is projected to increase dramatically, thus greatly increasing the burden of care. Early detection of the cognitive decline that precedes dementia is considered to be of great significance for many reasons. For subjects with remediable causes such as nutritional deficiencies or complications resulting from taking medication, early detection of cognitive decline can significantly increase the chances of recovery and prevent further decline. For subjects with irreversible conditions, early detection of cognitive decline still provides them and their families with an opportunity to proactively plan for their future by seeking the appropriate interventions that can enhance their daily functioning and reduce any emotional stress or fear. Early stage cognitive decline is challenging to detect in the context of traditional doctor visits, as many of the subtle clues are difficult to spot. However, recent studies have shown that early changes in motor capabilities precede and may be indicative of a cognitive impairment, and that subjects with mild cognitive impairment exhibit a more variable and less consistent pattern of activity throughout the day. Accordingly, and with the advancement in technology and the proliferation of smart systems, a good alternative to the traditional clinical paradigm is to bring assessment into the daily activity of a person in their home environment via unobtrusive sensors and smart systems. Our main contributor, ORCATECH (ORegon Centre for Aging and TECHnology), has already developed and pilot tested a community-wide, scalable home-based assessment and platform protocol by employing unobtrusive sensing technologies in the homes of a minimum of 300 healthy seniors for at least 36 months. The subjects were assessed in-home at baseline, and during annual in-home visits using standardized health and function questionnaires and physical and neurological examinations. Data were collected via a network of wireless sensors that were installed in the home of each subject. In order to detect movement and general activity, passive infra-red motion sensors were installed in rooms frequently visited by the participating subjects. Also, walking speeds were estimated unobtrusively by placing motion sensors on the ceiling approximately 61 cm apart in areas such as a hallway or a corridor. These sensors had a restricted field view of ±4° so that they would only fire when someone passed directly under them. All sensor firings were sent wirelessly to a transceiver, where they were time stamped, and then stored in an SQL database. How accurately can machine learning algorithms detect MCI in older adults using a number of measures calculated from unobtrusive sensing technologies? Accuracy is measured in terms of sensitivity, specificity, precision, and recall scores. Can we build proper statistical models of the subjects’ general activity in their homes and of their in-home walking speed using an approach that is robust to the idiosyncratic nuances of the individual subjects? What is the minimum level of sensing required to detect MCI in older adults using obtrusive sensing technologies? Figure 1. 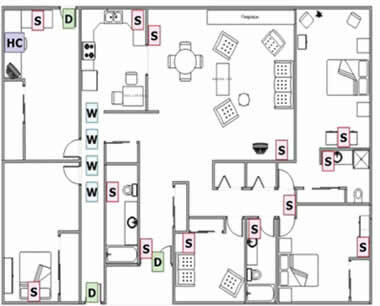 Example of a home layout. 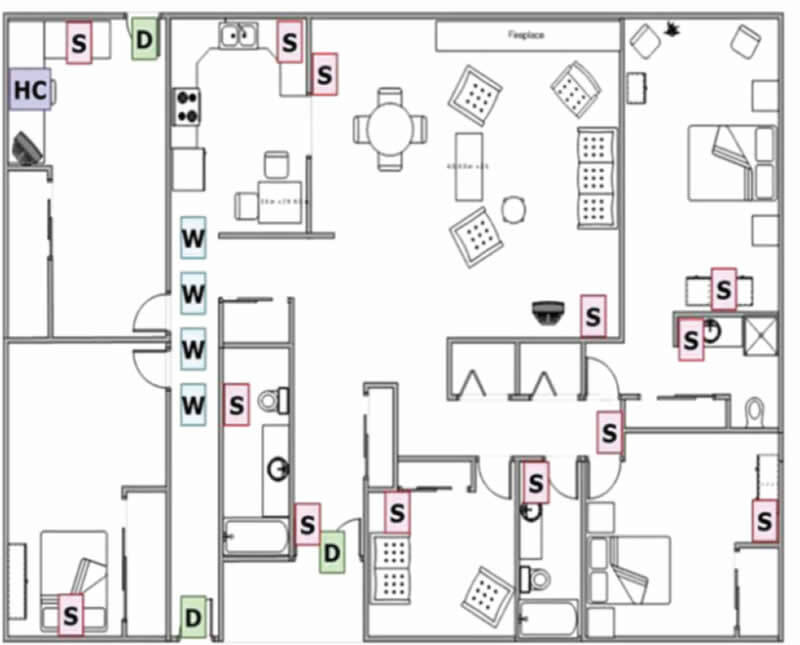 Red boxes (S): locations of passive infrared motion detectors; green rectangles (D): contact sensors on exit/entry doors and refrigerator doors; blue boxes (W): sensor lines for measuring walking speed; HC: home computer location  (click to enlarge Fig. 1). J. A. Kaye, S. A. Maxwell, N. Mattek, T. L. Hayes, H. Dodge, M. Pavel, H. B. Jimison, K. Wild, L. Boise, and T. A. Zitzelberger, “Intelligent systems for assessing aging changes: Home-based, unobtrusive, and continuous assessment of aging,” The Journals of Gerontology Series B: Psychological Sciences and Social Sciences, vol. 66B, no. suppl 1, pp. i180–i190, 2011.